There are a huge number of options for shopping in Bogota. The options range from small informal shops on street corners to large modern shopping malls. Atlantis Plaza is located in La Zona Rosa at Calle 81 with Carrera 13. It is small compared to other shopping malls in Bogota, but is a fashionable place for trendy Bogotanos. It is made up of 5 floors, with a cinema on the top floor. The Hard Rock cafe at the front entrance is a popular hangout. 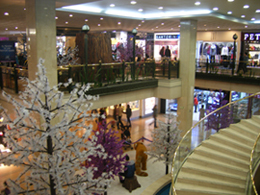 Andino is traditionally one of Bogota's most popular and highly regarded shopping malls. It owes a lot to its location as it is slap bang in the middle of La Zona Rosa a couple of blocks from Atlantis Plaza. As well as a large number of shops Andino contains a big food court on the top floor and also a casino. One of Bogota's older shopping malls, Unicentro contains over 300 shops, a food court, casino and bowling alley. Opened in 2006, Santa Fe is the largest shopping mall in Bogota and Colombia. It contains over 500 shops, a food court and cinema. 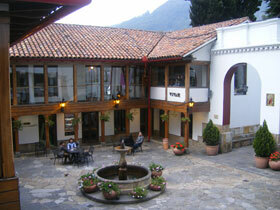 It is located in the district of Suba in the north-east of Bogota on the Autopista Norte with Calle 183. To get there by public transport take the Transmilenio to the northern end of the line (Portal del Norte) and then take the Transmilenio connection bus (alimentadora) called '2.1 Mirandela'. Located in Usaquen near to where carrera 7 meets avenida 116 is the shopping mall Hacienda Santa Barbara. It is a mixure of old and new where beautiful colonial shops and small plazas seamlessly mold into the mall's shiny, modern section. The plazas in the old section contain some lovely cafes and bars which become busy with Bogota's northerners after office hours. The newer part includes a large food court. Many Bogotanos will tell you that shopping centres like Andino and Santa Fe are better, but personally Santa Barbara rates as my favourite place for shopping in Bogota. This is one of Bogota's older shopping malls. It doesn't rate as one of Bogota's most attractive or exclusive shopping venues, but includes over 100 shops and a cinema. It can be found in the north-west at Avenida 68 with Calle 75. Another of Bogota's new shopping malls, Gran Estacion has become very popular since its opening in 2006. It has over 300 shops including an Exito supermarket and a cinema. It is situated in the west of the city about 10 minutes from El Dorado International Airport. As most of the large shopping centres are located in the north this is quite convenient for those living in central and southern districts. This is a huge outside market and the ideal place to come if you're after electronics, clothes, watches, music or pretty much anything, including items of dubious origin. It's a great place to pick up a bargain or two. Exercise cautioun though, especially by trying out any electrical goods before handing over your pesos. The area is reasonably well policed, but as San Andresito is in a slightly rougher part of Bogota just be a little more cautious than you would in other parts of the city. If you take sensible precautions San Andresito can be one of the best places for cheap shopping in Bogota. Chceck out the main Bogota page for more information on this city.